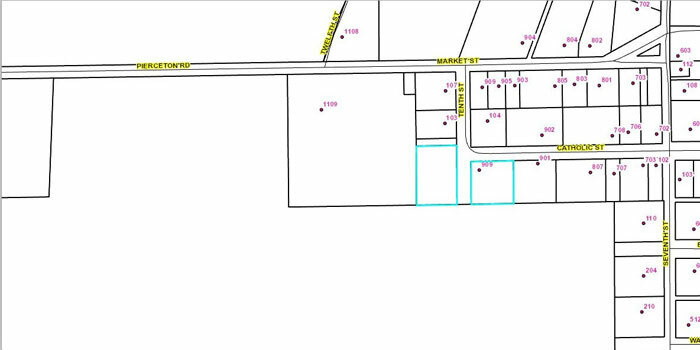 Public right of way at 909 W. Catholic St.
PIERCETON — The closing of a public right of way next to 909 W. Catholic Street, was tabled by the Pierceton Town Council Monday evening, March 14. Norma Wood, owner of the property, presented to the council at one time the property was going to be a developed as a mobile home park, but never came to fruition. She says she would like to build a house on the property and would like the public access right of way closed. The council held some discussion, but tabled the matter as Wood’s lawyer did not show up for the meeting. It is expected to be discussed at the April meeting. During department reports, Tim Sammons, town marshal, informing the board Priority 1, from Fort Wayne, had updated the surveillance equipment on Monday, Feb. 15. One of the cameras was not compatible with the new upgrade. Sammons says Priority 1 will possibly be out within the month to replace it. Sammons also informed the board the school resource officer for Whitko Community Schools completed his training about two weeks ago and all that was left for the School Resource Officer to do was complete Law Enforcement Academy. Pierceton Fire Chief Gordon Baker talked about the fire station tracking response times, man hours and the area the department is called to the most. Baker says this information could be useful if a grant opportunity for available resources or equipment presents itself. Baker stated in the meeting it was time to update the firefighters in the Occupational Safety and Health Administration respiratory protection plan program, which means the firefighters need to be “fit-tested” and approved for an “immediately dangerous to life or health” atmosphere. Anyone in the department who uses a self-contained breathing apparatus must either, have a physical preformed by a doctor or fill out a medical paper for doctor approval or denial. The next town meeting will be 6:30 p.m. Monday, April 11.